The Dutch government has issued a traveler warning "besmirching" Jewish residents of Judea and Samaria and falsely portraying them as regularly conducting rock-throwing attacks, while making no reference to Arab terrorists in the region hurling rocks at Israeli cars on a daily basis. In the warning, which was posted last month on the Dutch central government's website about the "Palestinian Territories" and reported by JTA on Tuesday, the Dutch warned, "there are security risks for traveling all over the West Bank including east Jerusalem. Be alert when traveling there." Who is throwing the rocks? 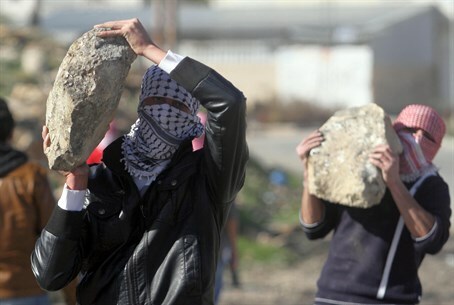 There have, in fact, only rarely been reports of Jewish residents in the region throwing rocks, certainly when compared to the incessant frequency of Arab rock throwing attacks. The latter have occasionally proven lethal, most notably in the murder of the infant Adelle Biton, who suffered critical wounds in an attack at the age of two and died in February after a two year struggle to recover, and in the murders of Asher Palmer and his baby son, Yehonatan, in 2011. Arab rock attacks have in fact become such an issue that there is a push in the Knesset to strengthen legal recourse against the phenomenon. And yet the Dutch traveler's warning does not mention rock throwing when referring to Palestinian Arab rioting, apparently assuming that the rock throwing would not target Dutch citizens who often are radical anarchists visiting the area to support the Arab violence. "Palestinians demonstrate regularly against occupation in various places," read the warning, justifying the rioting. "These demonstrations sometimes involve violence. There are always Israeli soldiers present during demonstrations. Avoid demonstrations. Recently, there have been violent incidents in the border area between east and west Jerusalem. They are aimed at Israelis. Be alert in those areas and avoid public transportation." The warning also warns against visiting Gaza so as not to be shot in gunfights between Islamist groups, noting that "in addition, there exists a risk of becoming a victim of an Israeli aerial attack." In response to the warning targeting Jewish residents, the Israeli Embassy said in a statement that the warning "besmirches a whole segment of society in an unacceptable way." The embassy said it will address the issue with the Dutch government. The Netherlands has seen a viral rise in anti-Semitism, which has included soccer fan chants lauding the burning of Jews; likewise, a study in 2013 found five million Dutch hold a satanic view of Israel.